It’s been awhile since I’ve read Christi Barth. When I was trying to decide if I wanted to read Bad for Her, what got my attention was the fact that the series itself focused on three brothers in WITSEC. 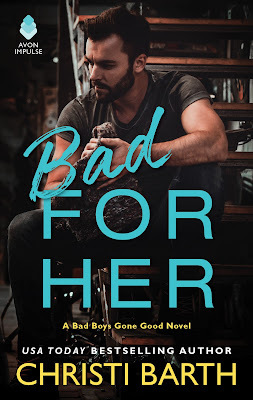 Once I started reading Bad for Her, I was sold on the story by the lead characters Mollie and Rafe. They have a flirtatious, passionate relationship. But what I really loved about them was their playfulness. The secondary characters of Flynn and Kellan, Rafe’s brothers are good as well. In fact, all the characters you get to meet in the book add something to the story. I’m really glad I decided to read this book. Initially, I had no idea why the Maguire brothers were under the protection of the US Marshals. The revelation was very surprising. What was also a surprise, was the character of Rafe. Yes, he was a mobster. Yes, he did some violent things. But Rafe lives for his family and is truly a man of honor. Mollie isn’t a shrinking violet. She’s made a conscious decision to return to her small town of Bandon, Oregon and live with her grandmother and young cousin. She’s a very caring person and knows what she wants. I have to admit that I have a serious issue with how these two meet. Mollie has a flat tire on a deserted highway and Rafe stops to help her. They proceed to flirt and then kiss each other. Mollie was seriously not thinking about her safety. Then Rafe….My goodness. The whole scene seemed a little too much like a set up to me. I mean the man is supposed to be fearing for his life and the lives of his brothers and he’s on the side of a highway with trees all around getting his flirt on? Maybe I watch too many crime shows, but I was seriously expecting a hitman to walk out of the forest. Regardless of the first meet scene, Bad for Her was a really good story. Christi spent a lot of time revealing Rafe’s character and his life experiences. She managed to make him someone that readers could understand, root for, and support. While Bad for Her is a full and complete story with a HFN, the mob angle is still in play. I’m looking forward to the next book, Never Been Good, to see what Flynn’s take on this whole WITSEC deal is and watching him fall head over heels for the waitress who doesn’t give him the time of day. 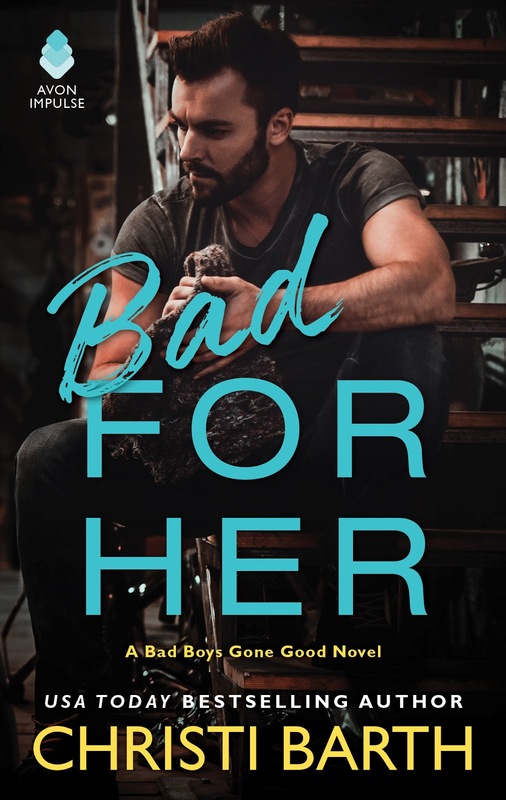 You can read an excerpt of Bad for Her here.